Hello Blackizz is it not time for a whole picture of your aquarium? 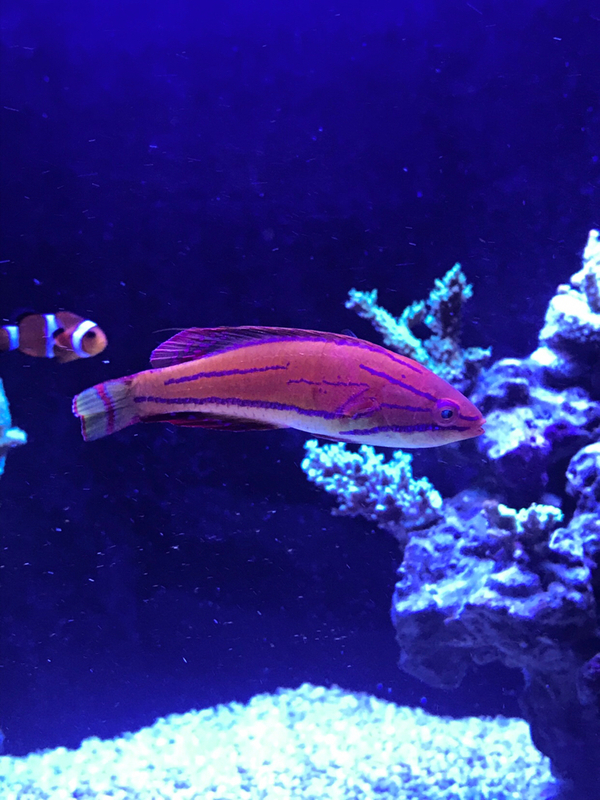 Ok so got hold of the PAR meter, fired it up and apparently I've been having lower par than optimal (could be the source some trouble) I've been around 250-290 at the top of the rocks, where most of my corals are, and I'd rather be around 350-400 there for "best" coloration and growth. I adjusted the LED's a bit, and I'm at 320-ish now, will lower the light in a weeks time to see if I can hit that sweet-spot. Looking clean, will be great when the corals grow. Tank is tugging along, I see some tiny growth, especially in the corals that were worse off after new years. I've started feeding more heavily, mainly to see if corals benefit from the increased food supply, despite doing this I'm not experiencing any algae problems, which is nice! Despite this, KH in the tank won't drop In my mind it would be going down some at least? Not dosing anything that would raise KH either. Anyways, despite some corals that have lost color, I'm not seeing any of the usual "high KH" signs (tip-burn etc). Testing is done by 2 different test kits, Hanna and Red Sea. Hello blackizzz, is it controlled for that nasty thing? Changing the water will make the situation worse or help? In the case of only blue lights, is the situation worse or controlled? That nasty thing really hindered me, I tried a lot of methods. That nasty thing has almost disappeared completely. I have my own personal experience and operation. I don't know if you are willing to try it. Maybe the good thing won't happen to everyone's tank, but it does bring the exact effect. After getting treatment, I thought for a long time and calculated the reason to go back. At the moment, I probably understand... I am not a scientist, maybe my guess is right. KH is rising, have you added other strains? ZS3, BB, KB, Xtra & FWS daily at recommended amounts. SP, AA, CV every other day. I also feed more than before. Perhaps the tank has just "matured" with time? Not quite sure what you mean, but I only dose what's in the post above, nothing else. I am very happy to be with you , this is an exciting thing, great. Maybe tank is "mature"
A new friend in the tank nearing a complete stocking fish-wise. Only a few days since introduction, and the Potters angel hasn’t really been friendly so far, but it looks like it’s been accepted now. Beautiful fish, can it be regarded as a functional fish?